Harvard is not at all the leftist enclave it is rumored to be. Before I arrived at Harvard, my parents warned me not to come home too liberal. I laughed it off, but there was some truth behind the joke—at one point this school was literally known as the “Kremlin on the Charles.” So naturally, I was ready for an institution where every other student identified as a communist, where conversations were centered around how to overthrow the bourgeoisie, and where Karl Marx could be spotted hiding behind the John Harvard statue. At first glance, I was pleasantly surprised to find Harvard much more intellectually diverse than I had initially expected. Before I even arrived on campus, I noticed the increased prominence of the Harvard Republican Club, which was receiving national fame as a result of its strong condemnation of then-candidate Donald Trump. In Annenberg Hall, I engaged in intellectual discussions with those across the aisle—libertarians and Republicans alike. And I became involved in interfaith efforts that allowed me to form relationships with members of the Jewish community. But I quickly became isolated as I saw the institutional legitimacy that is granted to those who advocate for hatred against Muslims and other minorities. And I realized that behind this veneer of intellectual diversity lays a dangerous status quo. 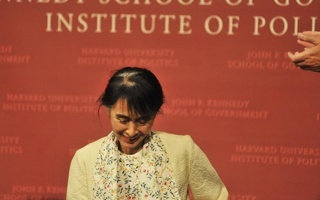 Just weeks into my freshman fall, I was shocked when the Harvard Foundation awarded the Humanitarian Award to Aung San Suu Kyi, the state counselor of the Republic of Myanmar. Suu Kyi’s regime is currently carrying out a genocide against Rohingya Muslims. She refuses to even acknowledge it, much less take action to condemn it. And Harvard recognized her as an international leader of peace. Suu Kyi is the rule, not an exception. Currently, Ayaan Hirsi Ali is a senior fellow at the Harvard Kennedy School. Ali has promoted the ideology that Islam is a “religion of violence.” Her words are unequivocally hate speech. And she is treated as a scholar and hero by one of the oldest and most powerful educational institutions in the world. This semester, the Institute of Politics has been filled with hand-me-downs from the Trump administration, including Sean Spicer and Corey Lewandowski. These men worked for a president who publicly called for a “Muslim ban,” furthered Islamophobic rhetoric during his campaign and presidency, and campaigned for an agenda that could only result in making America white again. And instead of unequivocal condemnation, Harvard offers accolades. However, recognizing or even honoring individuals like this is not just done by the administration. It is reflected among the student body as well. Look no further than the rise of the Harvard College Open Campus Initiative, which professes to encourage “the freedom of thought.” But the speakers who have been invited fit the same pattern of being among those who speak against minorities. These include Jordan Peterson, who rejected the validity of trans identity, and Charles Murray, who is a white nationalist. The free speech arguments used to justify the presence of such thinkers on campus would be easier to swallow if the discourse was more equal. I would never consider any sort of leftist comparable to those who disregard the very humanity of others, but there is no denying that the tolerance for even such voices is much lower. Just consider Chelsea Manning’s dismissal by the Kennedy School or the controversy surrounding PBHA’s recognition of Nihad Awad. And so, a status quo is set. In this status quo, Harvard encourages free speech. Harvard encourages controversial speech. Harvard even encourages hate speech. But with one simple catch—those affected by that speech are those who are already minorities. They are the marginalized students whose voices are easy to push to the side. This status quo is not just bureaucratic. It is present in campus culture. Minorities are expected to be moderates, reaching across the aisle to those who don’t even respect their humanity. I am not supposed to be angry or radical or too left. When one of my peers makes a joke about “PC culture,” I am expected to laugh instead of pointing out that there’s nothing wrong with tempering our words and actions to make those around us feel safer. I am expected to moderate my opinions and find common ground with those who affiliate with a political party whose leader is literally a white supremacist. In addition, when reaching out, I am expected to temper myself and recognize my privilege as a liberal on this campus. The fact is that I have no such privilege. Harvard is not a leftist enclave. It is not a liberal safe haven. And it shouldn’t be. But it should be a place for equal dialogue, where every student can feel like they have a voice. But when the institutional structures support those that advocate hatred and campus culture encourages moderation and middle ground and shrinking, this is impossible. In one of my previous columns, an anonymous commentator suggested that I “unseal [my] lips and engage.” I’m trying to. In fact, that’s the whole point of this column. Since my freshman fall, I’ve been looking to grow and learn from those more conservative and more liberal than me. But while the Trump supporters have proved easy to find, the communists have not. And I’m tired of only speaking with those on the side of the aisle that has summarily rejected me. I’d like to go beyond that. So if you happen to know a communist, send them my way. I’m looking. Shireen Younus ’20 is a Crimson Editorial editor in Pforzheimer House. Her column appears on alternate Thursdays. While the Harvard Foundation’s statement condemning Suu Kyi is welcome, it is much too little, much too late. In a world that views political identities in binary form, my refusal to pick a side means that I automatically get labelled as being part of the "other" side.